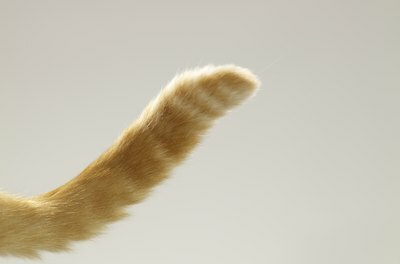 Acquaint yourself with your cat's tail behaviors. Trying to figure out the meaning behind a cat's actions and behaviors can sometimes seem as confusing as trying to decipher texts in an ancient language. If your cat is keeping her tail low and you can't figure out exactly why, the reason could be anything from mood to injury. If your poor kitty's tail is hanging down and shows no signs of coming back up, then serious nerves may be at fault. This cat is feeling especially stressed out about something, whether it's the presence of a large and imposing St. Bernard outside of her window or the sight of your suitcase on the floor in front of her. When a cat is low in confidence and feeling uncertain, not only will her tail be low, it'll probably also be hidden between her hind legs, too. When a cat absolutely refuses to lift up her tail, it could also indicate that she's feeling defeated and helpless about a situation. She's not going to put up a fight. Perhaps another larger and stronger cat is about to physically attack her and she feels like she's no match. Maybe she's in her carrier in the car on the way to the dreaded veterinarian's clinic and just doesn't know what to do with herself. A low-hanging tail is frequently a clue that a cat is feeling submissive, exposed and feeble. In some situations, the lowered tail may indeed signify that a cat is scared and intimidated by something, but is also in no way ready to give in. When a feline's tail is hanging low, she actually could be getting ready to defend herself physically, whether through chasing, pouncing or utilizing those sharp claws and teeth -- yikes. Never make the assumption that a lowered tail means that a cat is feeling meek, as it could go both ways. If your cat won't lift her tail, consider the possibility that perhaps she is actually physically unable to do so. According to the Cornell University College of Veterinary Medicine, injury to the tail could lead to neurological damage. 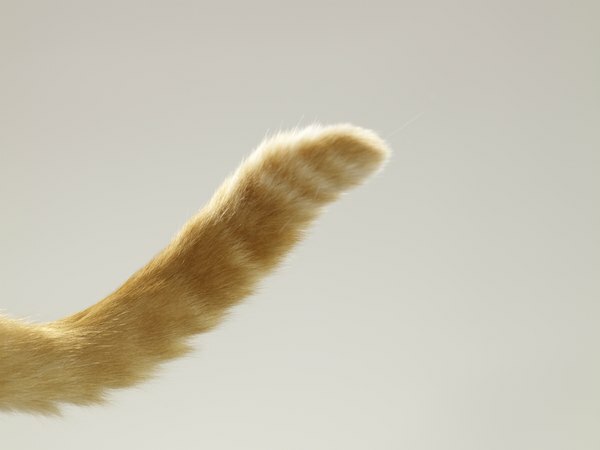 If a kitty's tail lacks any nerve roots, not only will it be impossible for her to lift it, it could also lead to other health issues, including full absence of bladder control. Get your cat to the veterinarian as soon as possible if you're concerned that her hanging tail woes may be neurological. What Does It Mean When Cats Stick Up Their Buttocks? Do Some Cats Walk With Their Tails Down?